ALVIN EPSTEIN, ACTOR, DIRECTOR AND MASTER OF BECKETT, DIES AT 93. The New York Times, Dec. 11, 2018. LONDON’S ‘MERRILY’ CAME TO BOSTON. Everything Sondheim, Oct. 19, 2017. A review of Maria Friedman’s production of “Merrily We Roll Along” at the Huntington Theater Company. MARIA & LENNY & STEVE. Everything Sondheim, Oct. 6, 2017. A review of Maria Friedman’s Bernstein-Sondheim cabaret show at 54 Below in Manhattan. (HAL) PRINCE OF BROADWAY. Everything Sondheim, October 2017. A review of the legendary producer’s career retrospective at Manhattan Theater Club. “PACIFIC OVERTURES”: History One Moment at a Time. Everything Sondheim, print edition, June-August 2017. A review of the Classic Stage Company production, directed and designed by John Doyle. CHILLING IMAGES FOR “ASSASSINS” AT ENCORES! Everything Sondheim, Aug. 1, 2017. A review of the Encores! Off-Center production at New York City Center. “SONDHEIM ON SONDHEIM” AT TANGLEWOOD. Everything Sondheim, July 13, 2017. A review of the one-night-only concert performance by the Boston Pops, veteran guest artists and Tanglewood fellows. ATTENTION MUST BE PAID: ‘Assassins’ at Yale Repertory Theater. Everything Sondheim, print edition, April-May 2017. A review of the production. OPERA OR MUSICAL? SONDHEIM MADE ‘SWEENEY TODD’ TO SCARE AN AUDIENCE. Everything Sondheim, Aug. 24, 2106. A report on Stephen Sondheim’s July 30 conversation with Jamie Bernstein at the Glimmerglass Festival. BEST SEAT IN THE HOUSE. The Sondheim Review, winter 2015. The actor Michael Cerveris looks back on the production that won him his first Tony Award: the 2004 “Assassins” on Broadway. AN EXTRAORDINARY PAIR. The Sondheim Review, spring 2015. An interview with David Loud, artistic director of the 92nd Street Y’s Lyrics & Lyricists program on the partnership of Stephen Sondheim and Hal Prince. EUGENE ONEGIN City Center Playbill, May 2014. Pushkin’s novel in verse, known to most theatergoers as opera or ballet, gets new life in a dramatic stage version from the Vakhtangov State Academic Theater of Moscow. ELEGANCE IN AN AGE OF CRISIS artdeco.org, March 2014. A look at Fashion Institute of Technology’s exhibition on fashions of the 1930s, from the Art Deco point of view. COMEDY TONIGHT: LONG ISLAND FORUM FEATURED VARIED CAST The Sondheim Review, spring 2014. A review of “A Funny Thing Happened on the Way to the Forum” at Bay Street Theater.IT’S NOT JUST THE REPORTERS WHO LEARN FROM UPI NEXT next.upi.com/blog, Nov., 22, 2013. Reflection on serving as a mentor in UPI Next’s Pakistan project.A CONVERSATION WITH MATTHEW BOURNE City Center Playbill, October 2013. The British director and choreographer completes his Tchaikovsky trilogy, bringing a new production of “Sleeping Beauty” to New York.HOMMAGES The Sondheim Review, fall/winter 2013. A review of “Liaisons II: Re-imagining Sondheim From the Piano,” a concert by Anthony De Mare at Symphony Space.SOLELY SYMPHONIC and UNPLUGGED The Sondheim Review, summer 2013. 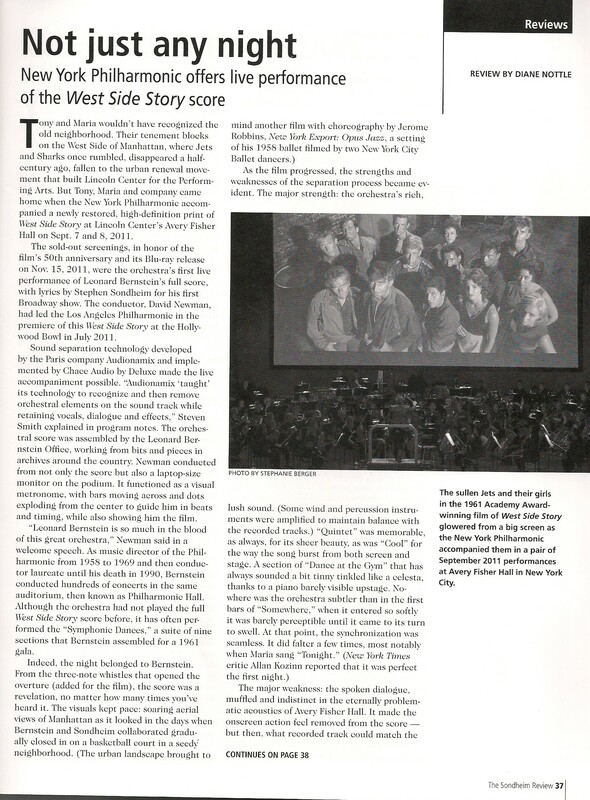 Reviews of the New York Philharmonic’s “Symphonic Sondheim” concert and the Sondheim Unplugged series at 54 Below.NEW YORK CITY OPERA RETURNS TO CITY CENTER City Center Playbill, March 2013. A company born at the midtown Manhattan performance space nearly 50 years ago returns this spring with two new productions. 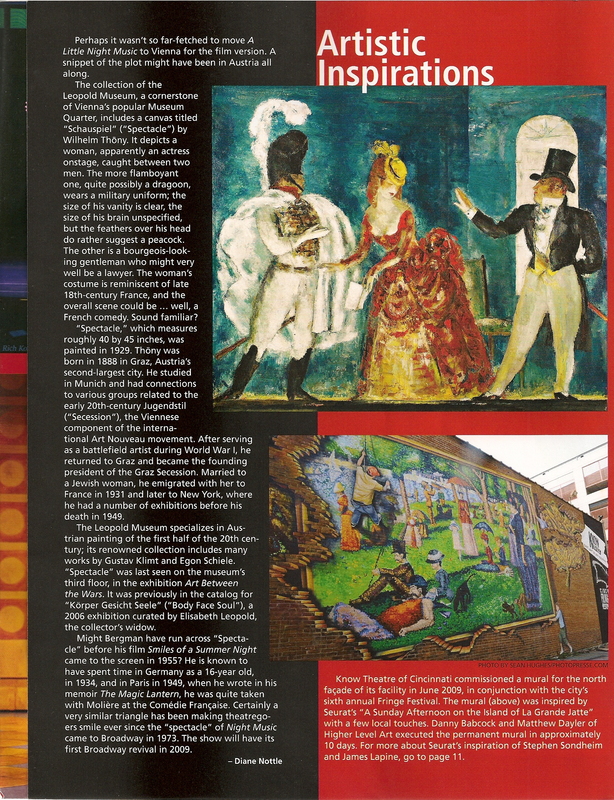 LONELY HEARTS The Sondheim Review, spring 2013. A review of the Keen Company’s production of “Marry Me a Little” at the Harold Clurman Theater in New York. BRINGING BACK THEIR SILLY FUN City Center Playbill, January 2013. The New York Gilbert & Sullivan Players return with Victoriana that still resonates — and makes people laugh — in the 21st century. ANNA KISSELGOFF Dance Magazine, December 2012. A profile of the legendary chief dance critic of The New York Times on the occasion of her receiving a 2012 Dance Magazine Award. TOURING IS A TONIC FOR AUSTRALIANS The New York Times, June 10, 2012. A look at the Australian Ballet on the occasion of the company’s Lincoln Center appearance during its 50th-anniversary season. P.R. AND JOURNALISM: AN AMERICAN VIEW Proto.pl, April 27, 2012. An introduction to the American system for public relations professionals in Poland. A BALLET COMPANY FOR SPAIN City Center Paybill, April 2012. Angel Corella adapts to his role as artistic director of the Barcelona Ballet. A DIALOGUE WITH DIANA VISHNEVA City Center Playbill, March 2012. The Russian prima ballerina talks about her work with contemporary choreographers and one legend in absentia: Martha Graham. NOT JUST ANY NIGHT The Sondheim Review, Spring 2012. The New York Philharmonic’s live soundtrack to the film “West Side Story points up the glories of Leonard Bernstein’s score — and the limitations of sound separation technology. “CHINGLISH” RINGS TRUE TO LIFE China Daily USA, Dec. 9, 2011. Reviewing a play as theater is one thing; reviewing it in terms of how closely it mirrors reality is quite another. With that mission in mind, I attended a performance of David Henry Hwang’s “Chinglish,” a new Broadway play about an American businessman’s miscommunications with the Chinese. OFF WITH THE FAT, IN WITH THE FIT China Daily USA, Sept. 20, 2011. There’s an ideal diet that lets you eat all you want, feel completely satisfied and still shed pounds. There’s just one catch, the very first step: you have to move to China. 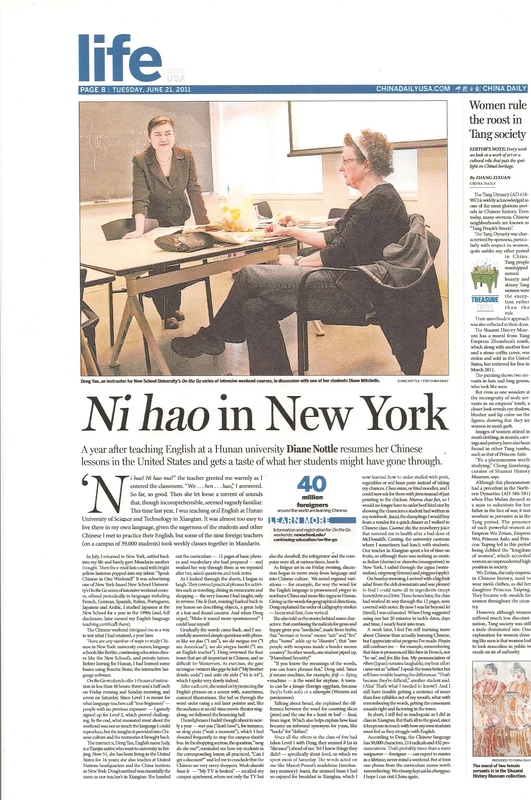 NI HAO IN NEW YORK China Daily, June 22, 2011. A year after a semester teaching in Hunan Province, a weekend intensive course in Mandarin presents an intriguing opportunity to test what I’ve retained. THE ALHAMBRA GOES ON TOUR The National, June 14, 2011. 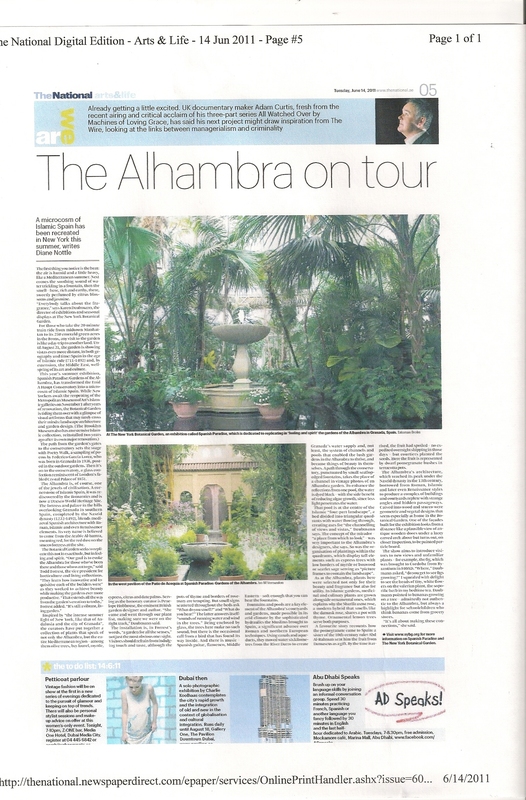 Any visit to the New York Botanical Garden is like a voyage to another world, but this summer’s exhibition, “Spanish Paradise: Gardens of the Alhambra,” takes visitors even farther afield: to Spain in the period of Islamic rule. RACE ON BROADWAY The National, Jan. 2, 2011. Maybe it has something to do with Barack Obama’s presence in the White House. Maybe Americans are due for some soul-searching. Or maybe it’s sheer coincidence that multiple long-term projects landed on Broadway at the same time. Whatever the reason, an unusual number of shows this season share a theme: race. Although written from distinctly modern perspectives, they add up to a historical narrative of how white America has dealt, often uncomfortably, with “the other” in its midst. THE SUMMER’S TALE The National, July 26, 2010. With so many Tony Award-winners already vanished from Broadway, the hottest ticket in New York this summer is Shakespeare in the Park — and not just because the price is right. FORM AND SUBSTANCE The National, May 10, 2010. The state of the arts at Expo 2010 in Shanghai. CHANGING ROLES The National, December 21, 2009. There’s a new princess coming to town and her name is Tiana. She’s pretty; she’s feisty; she has a dream, along with the determination to make it come true. And, for the first time in an animated feature from Walt Disney Studios, she’s African-American. RHYTHM OF LIFE The National, December 19, 2009. The new musical Fela! officially opened last month, but even before that, audiences were moving to his beat in five weeks of previews and an Off Broadway run last year. The music is mainly Fela’s own, and the show is directed by the respected modern-dance choreographer Bill T Jones in his second Broadway outing. STUDENTS WILL LISTEN The Sondheim Review, December 2009. How teachers of English to speakers of other languages can use Sondheim lyrics in their lessons plans. MONSTER CACHE The National, November 22, 2009. One of Tim Burton’s most popular films, The Nightmare Before Christmas (1993), adds Halloween elements to the Christmas mix. And now, as New York girds for its own seasonal nightmare – the annual holiday onslaught of shoppers and tourists – the Museum of Modern Art presents the exhibition Tim Burton, a retrospective that covers 40 years and includes more than 700 drawings, paintings, sculptures and films. LEAPS AND BOUNDS The National, November 16, 2009. In 2005, RoseLee Goldberg made an impression on the avant-garde arts scene by presenting Performa 05, billed as New York’s first biennial of “visual art performance” She had little staff, little money and no institutional support. Now, just four years and two biennials later, Performa has become something of an institution itself. PICKING UP THE BATON The National, October 21, 2009. Alan Gilbert, the latest musical director of the New York Philharmonic, is an unassuming and approachable man with grand ambitions for his orchestra. ACROSS BORDERS The National, October 7, 2009. Abu Dhabi Classics kicks off this month with the New York Philharmonic’s UAE debut. Diane Nottle looks at what the orchestra is doing under its new director, Alan Gilbert, and what audiences can expect to hear. FAITHFUL TO HIS MEMORY, AND HIS MOTHER The New York Times, December 7, 2008. “Why don’t you keep my mother company?” he said. And she did, for 23 years. 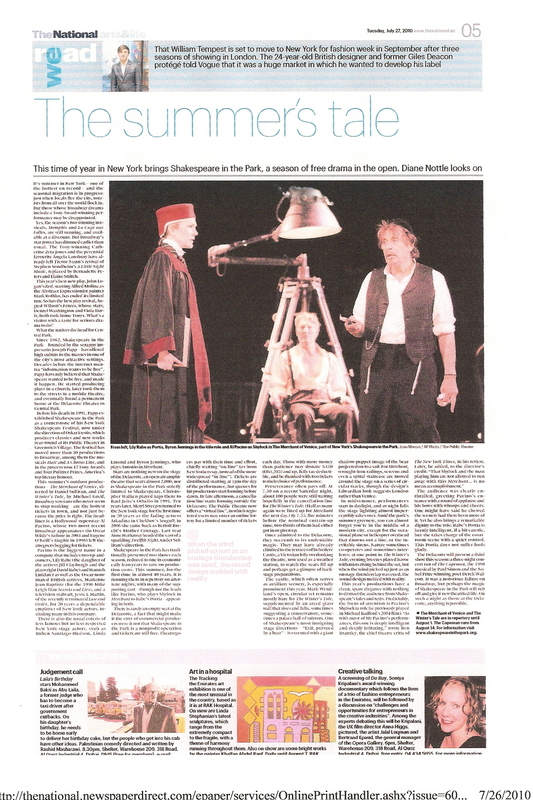 SIMON RATTLE, ABSENT AND PRESENT The New York Times, November 18, 2007. An autumn weekend with multiple rites of spring. PAST ARTICLES may be viewed in the archives of The New York Times and The Boston Globe.